No, Lacrosse Is Not A Regional Game. Watch How It's Conquering America. 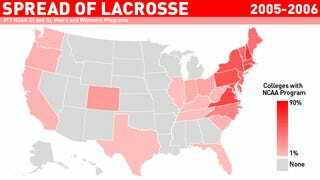 In yesterday's post about America's regional sports, a lot of commenters asked why I didn't include lacrosse. Well simply put, it just isn't that regional anymore. While it has a historical reputation as a niche sport—wealthy, Northeastern/mid-Atlantic, and "preppy-as-balls"—its geographic range, at least, is now all but boundless. This was a regional sport. 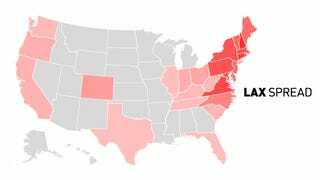 There were 317 programs spread across 26 states, but 84 percent of those programs were in New England or the mid-Atlantic states, and 61 percent of those programs were in New York, Pennsylvania, and Massachusetts. This distribution is pretty similar to what field hockey looks like today. By the 2014-2015 season there will at least 516 NCAA lacrosse teams, a 63 percent jump in one decade. That's just insane. A lot of this growth is taking place in lacrosse's base territory—by 2014, 87 percent of Connecticut colleges will have a lacrosse program, up from 61 percent in 2005—but the sport is overrunning the rest of the country. By 2014, mid-Atlantic and New England programs will have seen their 84 percent share of NCAA lacrosse shrink down to 65 percent, while that stronghold of New York, Pennsylvania, and Massachusetts drops from 61 percent down to 41 percent. Data on NCAA programs are readily available, which is why they've been the basis of most of these regional sports maps. But NCAA teams are probably a lagging indicator of a state's real participation in a sport—before a state school can have a competitive NCAA program there likely has to be a base of high school programs already in place. High school lacrosse has been cropping up in some very unlikely places, so give it another decade and no one will even question that lacrosse is a nationwide sport. New 2013-2014 and 2014-2015 programs courtesy of the The Growth Blog.